Journalist, Legal Advisor to Chief Mangosuthu Buthelezi, jailed from 1966-1970 under the Suppression of Communism Act, charged with treason, 1956 Treason Trial. As a young person, Arenstein joined the left wing Book Club in Durban where, among other authors, Marx and Lenin were read and discussed. At the age of 21, she joined the Communist Party of South Africa, where meetings were held at the Gandhi Library in Durban. It was here that she met, among others; HA Naidoo, Pauline Podbrey, Dawood Seedat and SV Reddy, some of whom were charged with her as co-accused in the 1956 Treason Trials. Arenstein worked as a journalist and correspondent for The Guardian from 1955- 56, and other newspapers such as The New Age. She also wrote articles for the Zulu medium Ilanga Lase Natal, before the Inkatha Freedom Party bought the publication. In 1944, Jacqueline married Rowley Israel Arenstein, a prominent liberation struggle attorney and political activist. They both worked in the trade unions along with activists such as Mike Diamond and Errol Shanley. With the banning of the Communist Party in 1950, Arenstein was declared a listed person by the state. Between 1953 and 1956, she was a member and treasurer of the Durban branch of the South African Congress of Democrats. In 1955, she was a member of the Secretariat of the Joint Executive of the South African Indian Congress, and the African National Congress. 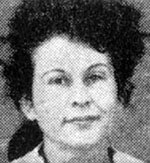 In 1954, Arenstein became a member of the Congress of Democrats (CoD) and contributed to the campaign for the Congress of the People, which was to be held at Kliptown in June 1955. Just before Christmas she was released on £250 and was able to reunite with her family for another two weeks in Durban. Arenstein returned to Johannesburg in 1957 and spent the entire year at the Drill Hall where the preparatory examination was conducted. The prosecution promised that this legal process would be completed in six weeks, but it took them an entire year to do so. At the end of the year charges were withdrawn against 65 of the treason trialists, including Arenstein. “Sonia Bunting from Cape Town, Jackie Arenstein and Dorothy Shanley from Durban, Ruth, Yetta and I from Johannesburg, spent more than two weeks in that cell, except for the times when we were allowed into the yard, which amazed me with its green grass and flowers in bloom. For the past three years, I had been trying to suppress my fear of gaol, yet knowing that I might one day have to spend time there. Once there, it did not seem so bad. In 1963, Arenstein was banned for five years. In 1973 she was banned again until 1978, when her banning order was renewed until 1983. In that same year she was appointed legal advisor to Chief Mangosuthu Buthelezi. • Side by Side: The Autobiography of Helen Joseph. Zed Books, Ltd: London. • Naidoo, P. (2006) 156 Hands that Built South Africa. Published by the author.